I’m undergoing a disk space crisis! My home server’s free disk space is starting to near the 1 GB mark. To top that off, my laptop the regularly shows the “Low Disk Space” alert. For my home computer, this catastrophe was likely caused by a mixture of downloading Linux *.ISO files, editing video, and following a ridged backup schedule. But, for the life of me, I couldn’t understand how I could use all 40 GB of disk space on my notebook computer. I mean, I only use it for work. Plus, every time I need to save something, I just transfer the files over my home network or the Internet to my server in my room. So, there shouldn’t be any reason for the “Low Disk Space” bubble warning to appear at anytime! But that ominous warning has become as commonplace as a pop-up advertisement. Many people are faced with this same situation. Even in this age where 200 GB are the norm, they run out of disk space but they don’t know what data is responsible for the shortage. Sometimes, it’s a forgotten file or folder. Other times, it’s just a chuck of data that a program or the operating system failed to delete, like the TEMP folder. Regardless of the problem, there is a program to me that helped find the source. It is called JDiskReport. JDiskReport is a program from JGoodies, a company involved in software development, consulting, and UI design. They provide freeware programs, one of them being JDiskReport, to showcase their work and what they can do for clients. JGoodies writes all of its programs in Java. This can be a good and bad thing. The benefit of using Java is cross-compatibility with other operating systems. The disadvantages of using Java are the increased processor usage (slow) and the additional download/installation of the interpreter in order to run the program. However, I think the features in the program outweigh the disadvantages of Java. JDiskReport scans any file tree on the computer. It can scan any root from the C: drive to the “Documents and Settings” folder. After the scan - which can take a couple of minutes depending on number of elements in the filetree - JDiskReport analyzes the sizes of each element and provides a comprehensive report on the disk space usage. 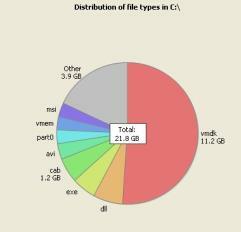 It lets you view many different statistics on each and every folder on your hard drive. You can see what subfolder is taking up the most space. You can view the 50 largest files or subfiles. You can see what types of files are taking up the most space. For me, it may be the *.ISO file type. You can see the space old files use. 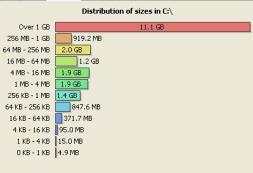 And you can see what the size range the largest files belong to. In the end, I discovered my problem with the laptop. I found out that I still had data left from the article I wrote for hacker not cracker about connecting to T-Mobile Hotspots for free with VMWare Player. Now I have 15 GB of free disk space! But with my desktop, that’s another story. I own many file archives. I’m thinking about purchasing another hard drive dedicated just for backup. This entry was posted on Wednesday, March 28th, 2007 at 12:35 pm	and is filed under Utilities. You can follow any responses to this entry through the RSS 2.0 feed. You can leave a response, or trackback from your own site.